The Misotsuchi Icicles are a gorgeous work of frozen art made possible by the harsh winters in the Oku-Chichibu area. Enjoy the magical atmosphere between mid-January and mid-February when the pillars of ice are illuminated. The Misotsuchi Icicles are located in the Arakawa Riverbed, just downstream from the Wood Roof Oku-Chichibu Auto Campground. There is a cafe and parking available. Just seeing the icicles is likely to chill you to your core, so head on over to Cafe Woodroof and its toasty wood-burning stove to warm up after you leave. 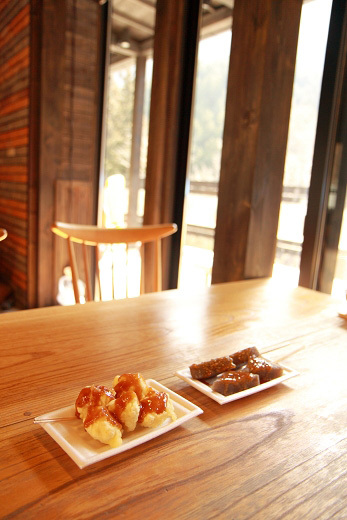 The cafe offers delicious homestyle dishes from the Chichibu region as well. There is also an icicles viewing platform (wooden deck) in the parking lot, so guests who may have trouble walking all the way down to the river can still enjoy the attraction.